During the PKF study period, the cumulative total of the four franchise related fees ranged from a low of 6.0 percent of rooms revenue to a high of 6.7 percent. 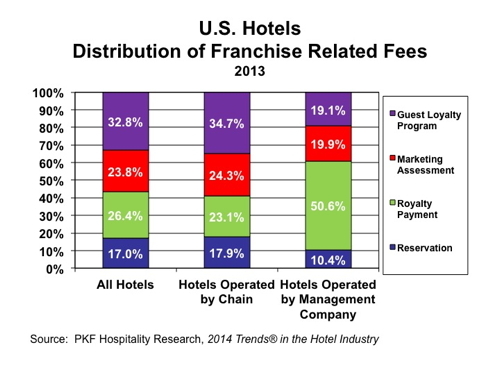 To gain a better understanding of the fees paid by hotel owners to their franchisors, PKF-HR analyzed the operating statements of 1,304 chain-affiliated hotels in our Trends® database that reported franchise fee payment data each year from 2007 through 2013. During the study period, the cumulative total of the four franchise related fees ranged from a low of 6.0 percent of rooms revenue to a high of 6.7 percent. 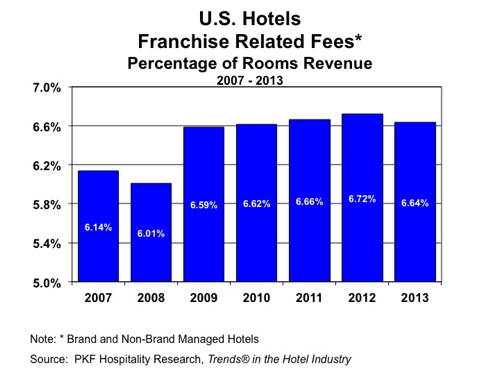 More often than not, franchise fees are charged as a percent of rooms revenue, or on a dollar per occupied room basis. Therefore, it is not surprising that the franchise fee ratio to rooms revenue remained consistent over the course of the seven years. What is notable, however, is the change in the composition of the franchise fees paid to the brands. 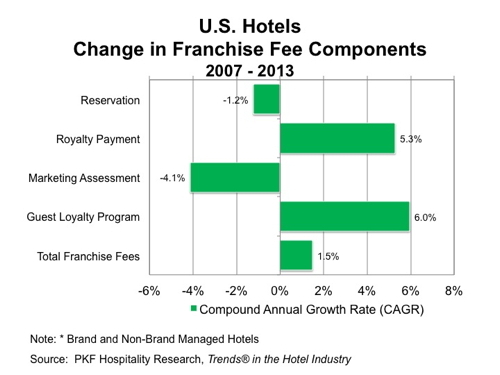 Since 2007, the portion of total franchise related fees assigned to guest loyalty programs and royalty payments has increased, while the assessments paid for marketing and reservation services have declined. Measured as a percent of rooms revenue, total franchise related expenditures in 2013 were highest for chain-affiliated resorts (10.5%), followed by limited-service (8.5%), suite with food and beverage (7.9%), and full-service (7.5%) properties. Chain-affiliated convention hotels paid the lowest ratio of franchise related fees (4.7%), along with suite without food and beverage properties (6.0%). From 2007 through 2013, the portion of total franchise related fees assigned to guest loyalty programs increased steadily every year ranging from 25.3 percent in 2007 to 32.8 percent in 2013. Not only have guest loyalty program payments increased as a percent of total franchise related fees, but the dollars paid have grown the most of all four fee categories increasing at a compound annual growth rate (CAGR) of 6.0 during the seven year period. Guest loyalty program fees are mostly a function of the revenue generated by loyalty program guests staying at a hotel. Based on interviews with franchising organizations, the percent charged by the franchisors has remained relatively steady during the study period. Therefore, it can be assumed that the primary driver of the growth in guest loyalty fees has been an increase in the number of program members staying at properties in the system. Royalty payments are made for the right to use the “brand name” and be entitled to all the marketing and operational support provided by the franchisor. From 2007 through 2013, the royalty payments made by the properties in the sample increased at a compound annual rate of 5.3 percent. In 2013 the marketing fees paid by franchisees made up just 23.8 percent of total franchise related fees, compared to 33.5 percent in 2007. During the seven year study period, the dollar value of the marketing assessments declined at a CAGR of 4.1 percent. The marketing assessment covers the costs of national advertising campaigns and sales support programs provided by the chain. The decline of this cost can be attributed to the efficiencies of internet advertising and marketing, and the concurrent reduced use of traditional historical forms of advertising and marketing (ex. publications, mailings, radio, TV). The reservation assessments paid by the hotels in our sample have also declined. During the past seven years, the average property in our sample paid 7.1 percent fewer dollars in reservation fees in 2013 than they did in 2007. Therefore, the reservation assessment ratio, which comprised 20.0 percent of total franchise related fee in 2007, dropped to 17.0 percent in 2013. Our study sample included self-operated hotels and properties operated by third party management companies, as well as hotels operated by one of the national chains. As expected, we observed a difference in the composition of franchise related fees paid by the chain-operated hotels versus the other properties in the sample. As expected, the greatest difference in the composition of the franchise related fees was found in the area of royalty payments. Royalty payments comprised just 23.1 percent of the total franchise fees at the chain-managed properties, compared to a 50.6 percent ratio at hotels that are either self-operated, or managed by a third-party company. The reduced ratio at the chain-managed properties can be explained by the fact that the brands frequently do not charge themselves a royalty payment (possibly in lieu of a management fee), but do charge for other assessments as a part of an allocation of corporate marketing and reservation services. Owners continually scrutinize the fees they pay to the national hotel chains. Analyzing them on a component basis provides further insights into the reasons for changes in the franchise fees paid, as well as the relative value of each type of assessment. Robert Mandelbaum and Gray McDade are located in the Atlanta office of PKF-HR, a CBRE company (www.pkfc.com). To benchmark the franchise related fee paid by your property, please visitwww.pkfc.com/benchmarker. This article was published in the August 2014 edition of Lodging.